The Awakening is a story arc that began early in 2012, and is still ongoing as of the time of writing (August 2012). Broadly speaking, this story arc revolved around the political, social, and economic situation in Britannia deteriorating due in large part to lack of leadership from the central government, and foes of Britannia (so far, most notably Exodus) taking advantage of that situation. 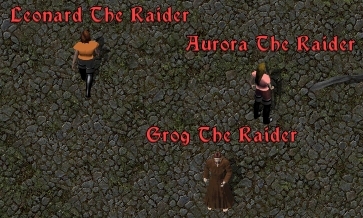 The specifics of this story arc differed somewhat shard to shard, due to Event Moderator input, thus attempting to satisfy Ultima Online players' long-standing like of shard-specific content and peculiarities. Guard Captain of Vesper near a Box of Ropes. "The citizenry of Britannia are beginning a rebellion, and we must do what we can to maintain order. Many of our poorer brothers and sisters are protesting, because they cannot earn a living in these hard times. Gifts of money, food, and clothing would go far to ease their fears. 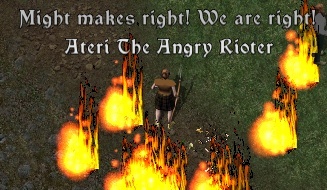 Some of our citizens have begun to riot. They have crossed the line and are causing destruction! There are too many of them for the city guard to handle. Please, take this rope and use it to arrest the rioters, and return them here. Groups of raiders from other cities have been infiltrating our city and attacking innocent citizens! These vagabonds must be stopped. Use spell and steel, or set your dragons loose on them if need be. Slay the raiders if you must. However, you may attempt to subdue and arrest them. If you do so, they must be returned to their home city. Our jails are overflowing! Our coffers are empty. The city cannot offer you any reward other than our thanks. Word of your deeds will spread. Be wary, though. Britannians are turning against each other. If you try to lend a hand to everyone, all may end up hating you. Right now, your loyalty means as much as your assistance!" An Angry Rioter in Vesper. Britain 7°54' S, 6°36' E Just west of the bridge, north of the Cat's Lair. Minoc 95°58' N, 77°29' E Inside the Town Hall. Moonglow 50°21' N, 133°1' W East of the city gates, next to the Moonglow Academy of Arts. New Magincia 56°41' S, 165°39' E At the docks. Skara Brae 51°35' S, 52°52' W Inside the Town Hall. Trinsic 100°48' S, 37°7' E Inside the Jail, just next to the west entrance of the city. Vesper 70°29' N, 118°15' E At the docks. Yew 62°24' N, 65°52' W South-east of the entrance of the Yew Prison, next to the Court of Truth. As the last sentence suggests, you should only help a single city of your choice since helping more than one city will make your loyalty decrease on other cities. A Guardman's Rope will drop into your backpack upon double-clicking on the chest Box of Rope which can be found near the Guard Captain. You take a rope from the chest. Use it to arrest rioters and subdued raiders. "Thank you for your assistance during these difficult times." You can calm the innocent Angry Protestors by giving them Gold or Food. From time to time, groups of 25 Raiders will attack a city. You can either subdue and arrest them or kill them. If arrested, they must be returned to their home city. Donating items or animals to the City Trade Ministers. Performing beneficial acts in other cities. A small fraction of the city's Hate for that character is converted into Neutrality. All other cities will convert some of their Love for that character into Neutrality. A small fraction of the city's Love for that character is converted into Hate. ‡: If you login once every 40 hours, the decay prevention will prevent cities' Love for you from decaying. Neutrality and Hatred values from cities will always decay. ‡: You can become Venerated immediately by donating 100,000 iron ingots to the City Trade Ministers. If the character performs a mixture of actions for a city, or performs beneficial actions for multiple cities, the character will tend to gain positive or negative ratings to a lesser degree or will gain distrustful ratings. arrest 500 Angry Rioters or help 2000 Angry Protestors for Venerated. 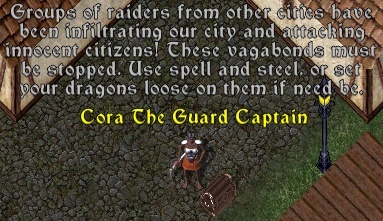 If your loyalty rating towards the city is high enough (~ Adored), you can purchase a City Banner from the Guard Captains for 250,000 gold pieces. the required minimum loyalty rating for the title. enough funds in your bank-box to donate for the title. You can only declare citizenship in a single city and you can renounce your citizenship at any time. However, you need to wait a week before declaring citizenship for another city again. The title can be aquired via options in the city loyalty menue. The amount you pay, goes direct into the town treasure. The trail of blood leading to Ver Lor Reg. This chapter introduced the potential for a threat to Britannia to emerge from Ilshenar. Some of the groundwork had already been lain by Event Moderators on some Shards. It started on March 1st (April 1st on Siege Perilous) with the fiction The Awakening - Act II and ended with Publish 78. 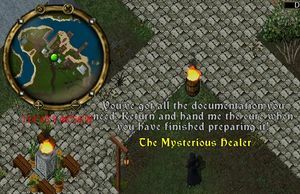 Unlike the other quests which you can see the progress and details from the quest gump or the quest log, it followed classic keyword style. The quest starts at the blocked passageway to the Exodus Dungeon. You will notice a trail of blood. You should follow it into the Gargoyle city of Ver Lor Reg. You can reach the blocked passageway from the Honor moongate in Ilshenar using the tunnel at 84º N, 43º W. From there go to the pass between the desert and the Exodus Dungeon. Shirron Argahrok waiting inside The Mistas Rigsit in Ilshenar. Greetings: I am Shirron Argahrok, and I greet you with Respect and Honor, adventurer. I wonder can you help? Help: My faithful Waymaster, Harlann, has been severely injured during the catastrophe that befell us. Catastrophe: I am unsure its cause, but many of our people died. Our nightmares became reality. Injured: With my people scattered, I have nobody to face the dangers necessary for the cure she needs. Cure: The cure can only be made with certain ingredients... one is found in Blood Dungeon. Blood Dungeon: There is a creature in its depths known as a purifying blood elemental... its blood is key. Creature: If you can help by bringing a sample of the purified blood from them, I'll reward you. Reward: I can show you the ways of climbing and give you equipment to scale the mountain. Mountain: I do not know what lies there after the catastrophe... but there must be something left. This will aid greatly. As promised seek the famous mountain climber. Tell him the Shirron sent you. Carl the Mountain Climber at the Gypsy Camp. Greetings: Did you hear that? I don't know what happened but the blasted mountain nearly collapsed. The Shirron sent me: Let me know when you are ready to learn. I am sure the Loremasters await an answer. Loremaster: I am sure whatever you find over there would be of interest to the Juka and Meer. Juka: The Jukan Loremasters can be found near Mistas. Meer: The Meer Loremasters can be found near Lakeshire. I'm ready: Let me show you how this is done... a real natural! There is some equipment by the mountain to use. 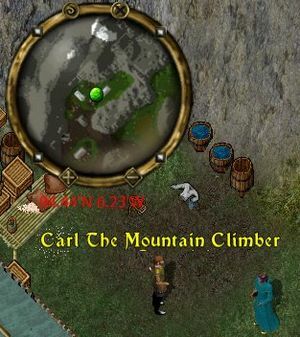 You will notice a climbing equipment near the mountain side. After you talk to him, say climb at the rocks right behind him. This transports you over the mountain next to the ruins of Lord Blackthorn's castle. Note that all of the heirlooms have the Lifespan property set to 86,400 seconds (24 hours) and they will disappear once the countdown timer has elapsed. The Grave Robbers have a lot of hit points and they also reflect half of the damage dealt every time you hit them. You should take the heirlooms you recovered from the Grave Robbers to the Jukan and Meer Loremasters. Note that gaining Loyalty for the Meer does not diminish your Loyalty for the Juka, and vice versa. You can also read the books written by other Loremasters and elders about the Jukan and Meer traditions while visiting Lakeshire and Mistas. Greetings: Greetings traveler, these are most uncertain times for the Meer. Uncertain times: In an instant, our people all had the same nightmare, a great war with the Juka. Great war: Our forest was burned to the ground, many of our brothers and sisters died. Forest: I had a vision of a forest on the other side of the mountain. Many of our Heirlooms were lost. Heirlooms: I fear they may be lost forever. Should find any and return them I shall reward thee. Reward: Place them in the storage chest. Prove your loyalty and you can claim a token of your devotion. Take the Meer heirlooms to Adair the Loremaster and put them in the chest next to him marked "Heirlooms". Put the Meer heirlooms in here to garner 50 Meer Loyalty for each. You can purchase a Meer Mage Statuette for 5,000 Loyalty points and a Meer Warrior Statuette for 10,000 Loyalty points. Greetings: I am the Juka Loremaster and I greet you with Respect and Honor. Loremaster: These are most uncertain times for the Juka. Uncertain times: In an instant, our people all had the same nightmare, a great war with the Meer. Great war: Our fortress was destroyed, where it once stood is now a crater. Fortress: There was a great flash and the ground shook. In an instant all our Heirlooms were destroyed. Heirlooms: Should find any and return them I shall reward thee. 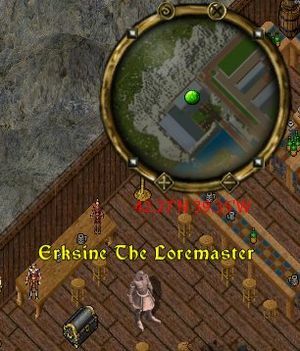 Take the Jukan heirlooms to Erksine the Loremaster and put them in the chest next to him marked "Heirlooms". Put the Jukan heirlooms in here to garner 50 Juka Loyalty for each. You can purchase a Juka Mage Statuette for 5,000 Loyalty points and a Juka Warrior Statuette for 10,000 Loyalty points. This chapter brought the role of Exodus into sharper focus. It started on April 10th with the fiction The Awakening - Act III. Like the previous act, it follows classic keyword style. Greetings': Alloa 'Allia, what 'ave we 'ere? Wha' ken ol' Slim do fer ya? Slim: Tha' be ma name, it be. Ya ain' no bleedin' guard, are ya? Buying: Now ya talkin', but talkin's easy---an' free. Tell ya wot tho'---listen close, aye? Aye: Ya han' over some gol' an Ah'll poin' ya ta what everyone's on abou'. Deal? "Grammercy, grammercy... Maps in tha box by tha back wall. Ya follow it..."
Follow: *grins crookedly* Follow it an ya migh' jus' come out richer'n when ya first came 'ere. Opening the crate will drop A Plainly Drawn Treasure Map into your backpack with a lifespan of 60 seconds, pointing to the northwest corner of Ver Lor Reg. 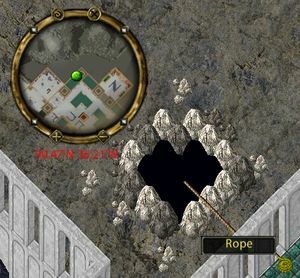 A Rope across to a large, black hole in the mountain side of Ver Lor Reg. 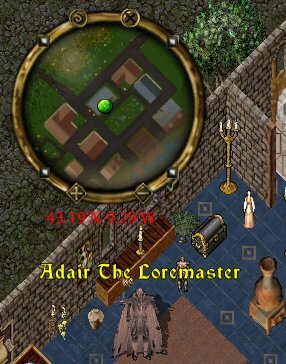 You should find the location on the map in the Gargoyle city of Ver Lor Reg. You can reach Ver Lor Reg by using the Honor moongate in Ilshenar and entering the tunnel at 84º N, 43º W.
You will notice that there are Exodus Overseers spawning just inside the city. Go to the blacksmith shop Agra-Char-In-Lem located in the northwest corner of the city and climb the stairs in the northwest corner inside, up to the roof. You will see a rope across to a large, black hole in the mountain a few tiles to the southwest. Use the rope to enter the Exodus Dungeon. A journal next to a Keypunch Reader inside the Exodus Dungeon. 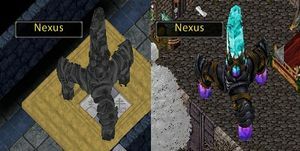 Left: An inactive Nexus inside the Exodus Dungeon. 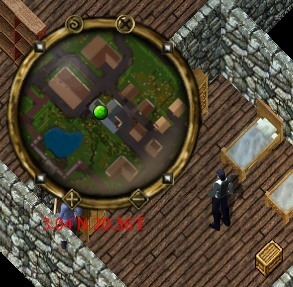 Right: A reward Nexus placed inside a house. You should kill Exodus Minions for a chance to receive a Mechanical Component which can be used to make an Exotic Toolkit by Tinkers who have 80.0 or more skill points in Tinkering. Note that the Mechanical Component has a lifespan of three days while the Exotic Toolkit has a lifespan of a week. You repair the mysterious Nexus! As it whirs to life, it spits out a punch card. As you feed the punch card into the machine it turns on! 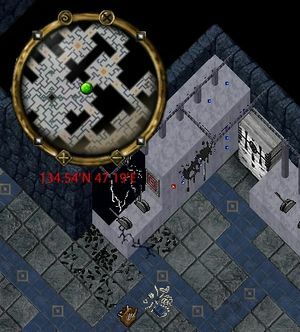 This chapter enabled players to collect pieces of the long-lost history of Ilshenar. It started on April 30th with the fiction The Awakening - Act IV and it is based on the catastrophe in Act II. Alec the Provisioner standing near the entrance of Ver Lor Reg. "Greetings Traveler! It is fine provisions you seek? Then look no further! For the modest fee of 1000 gold I will provide you with usable sifting tray! This sifting tray will no doubt allow you to uncover untold riches in the shifting sands of this desert! Before you get too excited you should know these sands can be treacherous and sifting should be done with care! Of most valuable interest are the antiquity fragments settled here from the recent catastrophe that befell the Juka and Meer. You'd be wise to search only in this area, as it is where most of the debris is concentrated. Happy Hunting! "You sift for a while and discover an antiquity fragment!" 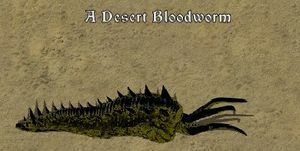 A desert bloodworm: "You sift for a while and disturb the underground lair of a sleeping creature!". Note that you cant sift while mounted, hidden, flying, in animal form or fighting. Also, while sifting there is a chance to disturb an underground lair of a sleeping creature: A Desert Scorpion, Rotworm or Bloodworm. They can also spawn in Paragon form. 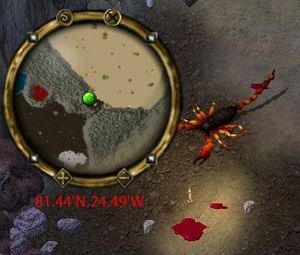 According to Crowen, there is 1 in 3 chance to disturb a random creature while about 1 in 20 to 40 chance to recover an Antiquity Fragment. ‡ : not reported so far. 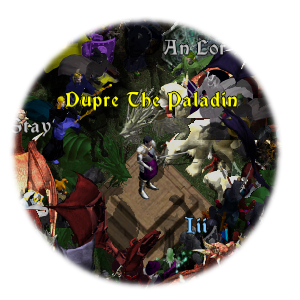 Lord Dupre addressing the crowd before the siege of Ver Lor Reg. During this act, Ver Lor Reg was first attacked and then fully re-occupied by Exodus, who had held it many years ago. The Call to Arms event for this act is run only once per shard between June 22 - 25, 2012. 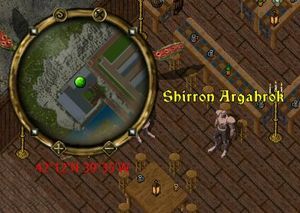 The time and date for the running of the event on each shard was publicized on the Ultima Online website via a published schedule. A mysterious plague began to appear in Ter Mur among the Gargoyles there, following the retreat of the Ver Lor Reg Gargoyles into Ter Mur to escape the oncoming Exodus onslaught. Official fiction (BNN: The Awakening - Act V) posted on June 11, 2012 indicated that the plague was carried to Ter Mur by the Ver Lor Reg gargoyles; the latter were immune to it, the former unfortunately was not. The plague carriers were isolated by Queen Zhah in the Fishing Village northwest of the Royal City. Ver Lor Reg was then was re-rescued by the players led by Dupre during the Call to Arms event. Exodus, after over ten years of being a mysterious villain at the fringes of the game, finally was killed. Scrolls of Valiant Commendation were awarded to some players participating in the destruction of Exodus during the event. This act concluded with the mysterious and worrying fracturing of the Honor Moongate in Ilshenar following the defeat of Exodus and the discovery of the mysterious tome known as A Weathered Journal. The Mysterious Healer in the Fishing Village northwest of the Royal City. This act began on June 2nd with the fiction The Awakening - Act VI and ended on August 13th with a controversial reward distribution. It was based on finding a cure for the plague that appeared among the Gargoyles in Ter Mur. "These documents should explain everything. Now, though, I must tend the sick. Their fate is in your hands. You've got all the documentation you need. Return and hand me the cure when you have finished preparing it!" I am overjoyed at your willingness to assist these afflicted gargoyles. It is without question that your actions are virtuous and I commend thee. Fortunately I have been able to work out the basic reagents needed in the preparation of the cure. Firstly you will require the Cuticle Sac of a Terathan as a binding agent. These can be found on Terathan creatures within their Keep on the outskirts of Papua. Secondly, to combat the foul taste of the preparation you will require vanilla. Vanilla can be found on various paragon creatures in Ilshenar, or for those with a green thumb the raw plant can be cultivated from seeds found on creatures deep within the Exodus dungeon. Third, in order to create the necessary solvent to dissolve the healing attributes of the cure you will require Raw Yeast. Raw Yeast is often carried by Orcs asa common cooking ingredient in their foul tasting breads! Fourth as sustenance for the Raw Yeast you shall require Sugar. Sugar can also be found on paragon creatures in Ilshenar. For the horticulturist, raw sugar cane can be cultivated from seeds found on Juka Mage, Kappa, or Plague Beasts. Finally, you will require Blightborn Slime as a means of building immunity to this horrible blight. My research indicates the slimes occur naturally within the depths of the Britain Sewers. Once you've collected the reagents your task is to assist in preparing the cure. While the reagents necessary will always be the same, the combination in which they are to be used changes with each attempt at the reaction. Succeed in determining the combination and your reaction will yield the Cure! Turn your prepared Cure in to me so that I can see that it is deliveredto those afflicted. For your assistance in this matter Queen Zhah has authorized unlocking the Royal Vault and as such should you be among those who turn in the most cures you shall be eligible for reward. I thank thee again for your assistance. Only together and united shall our efforts result in success, so that we may see the end of this horrid Blight!" "Once you have collected the necessary reagents you may attempt to decipher the combination of each reagent necessary for the cure. To begin your work visit the makeshift laboratories setup in the buildings here. There, you will find a laboratory bench. Of particular note are the Flask, Heating Stand, and Tongs. To add reagents, double click the flask. You may add up to three of each reagent, and must add at least one of each reagent. To empty the flask and get back the reagents added, double click the tongs. When you are ready to test your combination use the heating stand. You will begin heating the contents and the number of correct reagents will be returned to you. With each guess the reaction will become increasingly unstable, until ultimately if you do not succeed at preparing the cure, the reaction will catastrophically fail. The combination of reagents changes with each success, and each catastrophic failure." The reaction is successful and you prepare the cure! "N of the reagents slowly fizz but the reaction fails." "It is unsafe to leave an experiment unattended. As a matter of courtesy, you discard the contents of the flask and secured the apparatus." "The reaction is successful and you prepare the cure!" "Your efforts are appreciated, we mustn't cease though, only N days remain before the Cure must be administered to the population!" The puzzle could be completed as many times as the player wish. 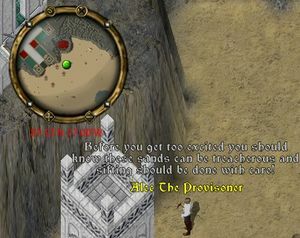 There were four rewards available in both human and gargoyle versions and the type of reward the players received was based on the race of the player who turned in the preparations. While it was possible to get more than one reward (and even all four rewards) for the top contributors, it was also possible to not receive any reward at all if the respective contributions were not on par with the distribution of other contributors. Tier 2 – Asclepius - When equipped during a complete healing cycle, the staff will provide a 20% bonus to damage healed using bandages. Tier 3 – Hygieia's Amulet - When equipped Hygieia's Amulet gives a 15% bonus to Alchemy. This page was last modified on 1 June 2017.